Yehuda Avner has published another of his reminisce essays, this one entitled The Mughrabi Gate Incident, and we reproduce it below, together with two of the broadsheets Avner mentions in his article. Up the alleyway he ran, a white-bearded man in a black caftan, his prayer shawl billowing over his head, scampering for his life, chased by a mob brandishing clubs, sabers and daggers, and howling, "Death to the Jewish dogs!" and "Save our holy places from the Jews!" and, "Allah Akhbar! God is great!" The fleeing Hassid, his bony face chalk white, now visible, now not, hidden at times by narrow tunnel passages, was losing ground. He stumbled, sprang up again, and incredulously turned about and, head-first, drove straight into the phalanx of the chasing mob, hollering hysterically, "Sh'ma Yisrael - Hear O Israel," as they cut him down. This testimony was given on Yom Kippur 1928, when an improvised, collapsible screen -a mehitza, to separate male and female worshipers - was set up in front of the Western Wall for the Sabbath of Sabbaths prayers. "Jihad! Jihad!" flashed through the bazaars. "The Jews are trying to rebuild their Temple and destroy our al-Aksa Mosque." In the months that followed hundreds were killed, culminating in the 1929 pogrom of Hebron, snuffing out an entire ancient Jewish community - and all because of that screen. Jews were allowed no quarter at the Western Wall. Unlike today, the sacred Wall was then but one side of a narrow alleyway flanked by a profusion of ramshackle Arab slum dwellings that extended all the way westward to the edge of the sharp rise where the Jewish Quarter began. This ramshackle quarter, which wore an air of perpetual grime, stench and sulk, was called the Mughrabi, and a roughly-paved walkway led up to a nearby Temple Mount gate - the Mughrabi Gate. As the riots escalated the British set up an inquiry commission and, stirred by Muslim sensitivities, decreed that the Arabs were the sole owners of the Western Wall, and that, henceforth, Jews would be forbidden to blow the shofar in its precinct. Many in the Yishuv sat up and gasped. What are we - a myth? Are our sacred texts legends? This most sacred of shrines, where prayers are ceaselessly said, tears ceaselessly shed, and the dead ceaselessly remembered - is it all a fairy tale? Some brave hearts defied the ban. Each year, as the Yom Kippur service ended - Ne'ila - a member of Betar, the youth movement of Ze'ev Jabotinsky and Menachem Begin's Irgun underground, would surreptitiously sound the shofar, and the police would move in and hit out in every direction. Menachem Begin was witness to one such Ne'ila on the Yom Kippur of 1943. WHAT HE saw was a battalion of British policemen, armed with rifles and batons who, in starched, ironed uniforms, brassy parade-ground belts, navy-blue peaked caps and polished boots, looked invincible. With the cool confidence of jailers taking the measure of a prison yard's inmates, they scanned the worshipers cramming the Western Wall's narrow alleyway, trying to pick out who might turn out to be the blower. And when the sun went down and the shadows lengthened they squeezed in among the pious, elbowing their way towards the Wall, weapons angled and primed. And then they heard it, and it drove them into a frenzy. A ruddy-faced sergeant, livid at the insolence, dashed toward a short figure clutching a shofar to his lips and, slapping the lad hard across the face, bellowed, "'Ere, stop blowing that thing." Other policemen set upon worshipers trying to defend him, clobbering them with their batons. The young blower kicked the sergeant away, and burrowed through the crush, spurting his way up the stairs trying to reach the murky warren of the Mughrabi. "Kill him. Stop him. Kill him. Stop him," cried the Arabs. "Keep going! Run! Run! Run!" cried the Jews. The boy dodged and leaped through the alleyway, until an outraged beefy officer felled him with a rugby tackle and two more kicked him in the ribs and pinned him down with their boots. Choked dumb with emotion, Menachem Begin was later to write: "Our ancient stones are not silent. They speak of the House that once stood here, of kings who once knelt here in prayer, of prophets and seers who declaimed their message here, of heroes who fell here, dying; and of how the great flame, at once destructive and illuminating, was kindled here. This House and this land, with its prophets and kings and fighters, were ours long before the British were ever a nation." And so he resolved to confound and frustrate the knavish tricks of his people's enemies who defiled this scared site. 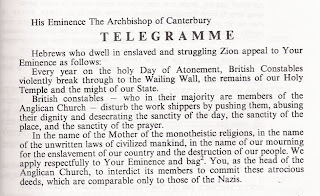 With audacious nerve, on the New Year that followed - 10 days before Yom Kippur - he instructed his pamphleteers and poster-stickers to splash it about that any British policeman disturbing the service at the Western Wall "will be regarded as a criminal and be punished accordingly." As the Day of Atonement drew near his warnings grew ever more strident, generating ever more grisly rumors as to what punishment Begin's Irgun men had in mind. "Criminal lunacy!" cried the Hebrew press, fearful of innocent casualties at the Wall. "The blowing of the ram's horn at the close of the fast is a mere custom, not an obligatory act," declared a tremulous rabbinate. And British intelligence speculated as to what casualties their police at the Wall might sustain if fired upon from unseen directions. Came the Ne'ila climax of Yom Kippur and in the ever-deepening twilight the white-clad cantor, facing the gigantic shadowy blocks of the antique Wall's weathered stones, chanted in a voice that swelled and soared, "Sh'ma Yisrael… Hear, O Israel, the Lord is our God, the Lord is One." and the whole congregation affirmed this declaration with single-minded intensity. And then, thrice he trilled: "Baruch shem Kavod… Blessed be the name of His Glorious Majesty for ever and ever," and thrice the assembly responded in emotional and dramatic confirmation. And now, seven times he, the cantor, in a voice that ululated higher and higher, his hands stretched out and up, intoned with trembling fervor, "The Lord is God. The Lord is God…" and seven times did the congregants avow this invocation. And as the cantor concluded the service with the final words of the Kaddish - "Oseh shalom bimromav… He who creates peace in his celestial heights, may he create peace for us and for all Israel; and say, Amen," the British policemen looked on, tense, edgy, crouched in confrontation, waiting for the order to pounce at the sound of the shofar. Rising on tiptoe, arms stiffened, eyes closed, hands trembling in excitement, the boy who had blown the shofar the year before blew a sustained, robust, soaring, exalted, single blast, reaching heights of pure perfection - and not a policeman stirred. "Fall out," barked the ruddy-faced sergeant to his men. "Return to barracks. At the double - one, two, one, two, one two…"
"L'shana haba'a b'Yerushalayim habenuya," hollered the crowd triumphantly after them. "Next year in rebuilt Jerusalem." And they danced their way through the Mughrabi to their homes in the Jewish Quarter. When Menachem Begin was told what had occurred he could not contain a smile when he said, "It was never our intention to start a clash at the Wall, for fear of inflicting casualties. Our attack was planned elsewhere - against British police fortresses in different parts of the country, and those we carried out." That episode of 1943(*), and the one that preceded it in 1928, and the one occurring right now in 2007 over the restoration of the walkway to the Mughrabi Gate - all are a composite of the Israel-Arab conflict in a nutshell. The Wall is the cutting edge. How goes the Wall so goes Israel. It is the heart and soul of the matter. Thus it was, thus it is, thus it shall ever be. To grasp that one does not have to be a biblical diehard or a rabid nationalist. All one has to be is a Jew.